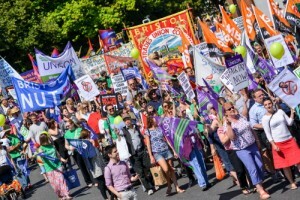 10th JULY STRIKE – BRILLIANT! 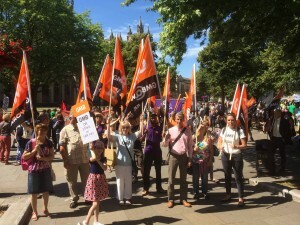 The 10 July strike in local authorities and schools was a huge success and GMB members played a massive part. Tens of thousands of workers attended marches and rallies throughout the country, there were active picket lines at every council and most schools were either closed or partially closed. While the government has tried to play it down, newspapers reported around a million people were on strike. This was a fantastic turnout and GMB salutes every single striker. News reports were dominated by the strike. Images of members on marches and demos filled TV screens. The anger and frustration of people on strike were on every front page. Ministers and employers were forced onto the back foot trying to defend the indefensible. The message about low pay and unfairness in local government and schools came over loud and clear. Our claim for a £1-an-hour increase for all council workers and school support staff was highlighted repeatedly. We want sensible consideration of our fair and reasonable case for better pay. We want proper negotiations over the paltry 1% offer for 2014. We want respect for the local government and school support staff workforce and for the dedication and loyalty they give every day. 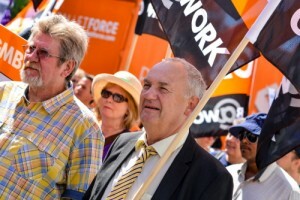 Our members, other union members and hundreds of thousands of other workers have sent a message to the national employers and it’s time to give something back to the workforce for all the hard work they have done over recent years in the most difficult of circumstances. Let’s hope they take heed or we will be forced to consider our next steps. 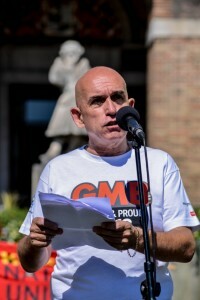 Thanks to every GMB member who went on strike. I will keep you informed of progress.